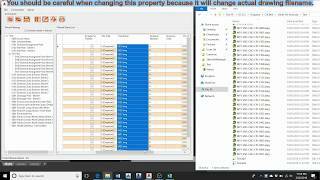 This tool provides a spread sheet interface that helps you to edit sheet properties (default and custom properties) easily like never before. You can directly copy to Excel or paste from Excel to edit sheets' properties, just like working in Excel. It also helps you to publish PDF or DWF files with a fully customizable sheet name to match with any naming convention required. You do not have to spend extra time to rename the files after publishing them. You can save a significant amount of time working with Sheet Set by using this tool. This tool should be used in conjunction with stock Sheet Set Manager as it concentrates on editing the sheets' properties and publishing. In future versions, we will be incorporating all features so that it can be used as a standalone tool. Working with sheets' properties in spread sheet (Excel like) interface. Edit property of a single sheet or multiple sheets easily in many ways: just select and edit; copy & paste from Excel; or using "Value template". Provide "Value Template" feature so that you can use other properties to assign a value for a selected property. Rename actual DWG file to match with any naming convention. Renumbering Sheet number with ease. 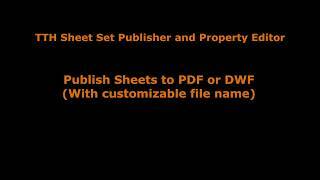 Batch publishing sheets to PDF or DWF files, with fully customizable sheet names. You will receive an activation code via your email address after purchasing the app. You can also use the app within 15 days without activation code. If you would like to start with an economical option, the one-year license is available for 26USD/year, prepaid. Please make payment to https://www.paypal.me/hoangtt/26 or contact us for more information.